Dashiell Hammett knew what a private detective should be. He knew because he had been one, and he had been taught by the very best. Born in Maryland in 1894, Hammett had failed at most everything he tried in the first two decades of his life. Intelligent, tall, and handsome, he did not finish school, could not hold a good job, and had no real direction in his life until 1915. In that year, things began to change. He became an agent for the Baltimore office of the Pinkerton Private Detective Agency, and he was surprisingly good at it. Despite his height, he could tail a person all day long without being caught. He could write a terse, energetic report. Most important of all, he could listen and learn. It was at this point that he needed — and fortuitously received — a good teacher. Hammett internalized all of these qualities, and although he did not always exhibit them in his personal life, he imbued his famous detectives, the Continental Op and Sam Spade, with them. These characters carried on tough, edgy conversations with clients and the people involved in their cases. The detectives never shied away from trouble. They could see people and situations for what they were, not for what others hoped them to be. Hammett lived an eventful and difficult life that included a 30-year affair with writer Lillian Hellman, great wealth, abject poverty, a stint in prison for refusing to rat on his friends, and continuing bouts of tuberculosis, alcoholism, and other illnesses. He was born in 1894 and died in 1961. 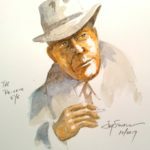 It was his vision of the private detective — the “private eye” — that inspired so many writers of his and subsequent generations. For those of us who love what he did, he wrote too little and died too soon. 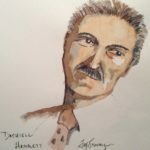 This post owes much of Prof. William Marling and his website, DetNovel.com, and particularly his entry on Dashiell Hammett. Layman, Richard (1981). Shadow Man: The Life of Dashiell Hammett. Harcourt Brace Jovanovich. p. 239. ISBN 0-15-181459-7.